The PKI 9840 is the most cost-effective and easy to use equipment currently available for protection against fragments and shrapnels from explosive devices. It has been designed for the use by both unskilled personnel as well as skilled Explosives Ordnance Disposal (EOD) operators, when confronted with a suspect explosive device in public area. PKI 9840 is already in use at many armed forces, police units, government and corporate offices etc. in numerous countries worldwide. 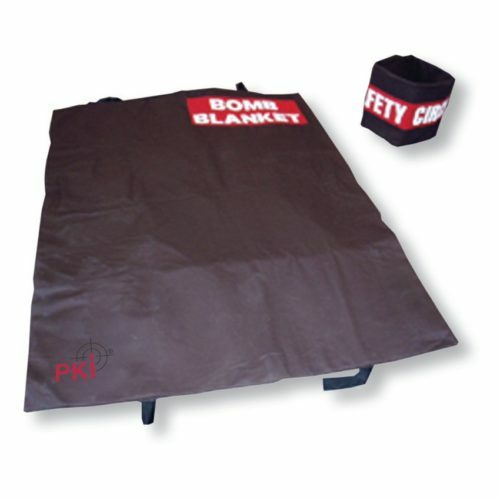 The PKI 9840 safety circle is placed around the suspect bomb and then the bomb blanket, which has four heavy-duty webbing carrying handles, is carefully placed over the safety circle surrounding the bomb. This eliminates any direct contact with the bomb and provides a safe environment for its examination and disposal. Two or more safety circles can be used together for larger bomb devices. Should the bomb explode, the safety circle directs the force of the explosion upwards, then the bomb blanket flexes and detains most of the fragments. The PKI 9840 is a light-weight, highly protective equipment made out of multiple- layer ballistic material and folds up into a compact, easily portable bag.